Went ahead and finished out Oryx last night with a group who was also at Oryx. All of us knew the mechanics and what to do. A few of them even beat him before so no explaining was required. We all just sort of took up positions and started the fight. 15-20 mins later Oryx was down, first try! It's wild how easy the fight is once everyone knows what to do and had some practice. Anyway, with my double drops I got enough to hit 300!!! I actually broke down the guns into my favorites but it was still enough to get me what I needed. I also got the 310 Artifact from Eris when I got back to the tower. After that completion, I went ahead and tracked down the last few fragments I needed and got my 45! Touch of Malice should be mine soon! All in all, it was a very good night. TL;DR - Beat Oryx, hit 300, got my 45 fragments, Touch of Malice coming soon. Nice, you've basically hit the threshold needed for replayablity, lol. The struggle from 295-299 is real. At least once you hit 300 you have the chance to start getting 300-310 drops. Gratz! Cool stuff. I need to start more raiding before halo and fallout drop, as I'm stuck at 297 right now. Drops in the Raid will help you a bunch. Be sure to do it every week cause you can get a lot of different stuff from each boss. Even if you don't beat the raid, get as many bosses as you can. Kenny got his 300 just off the first 2-3 bosses in the Raid. S7 mrmiller wrote: Cool stuff. I need to start more raiding before halo and fallout drop, as I'm stuck at 297 right now. I'm in the same hole. I need like something many points higher or I need to push a handful of items to 300+. Seems like multiple raid run looking for 300ish items will be needed. f#ck yeah! The raid was SUPER nice to me and believe me I understand just how lucky I was. I am super f'ing stoked! Niiice! that's a pretty awesome run. Looks like RNG was loving all over you Husker, well done. DeadSockPuppet wrote: Looks like RNG was loving all over you Husker, well done. Yeah, definitely. I can't believe I got that much in one run. Finished Oryx off with a random group. Through all my loot I landed at 303. Next on the list is snagging Touch of Malice. AtrumX wrote: Finished Oryx off with a random group. Through all my loot I landed at 303. I'll help you with the Touch of Malice quests if you help me with the lat exotic sword quest when I get it! Nice. 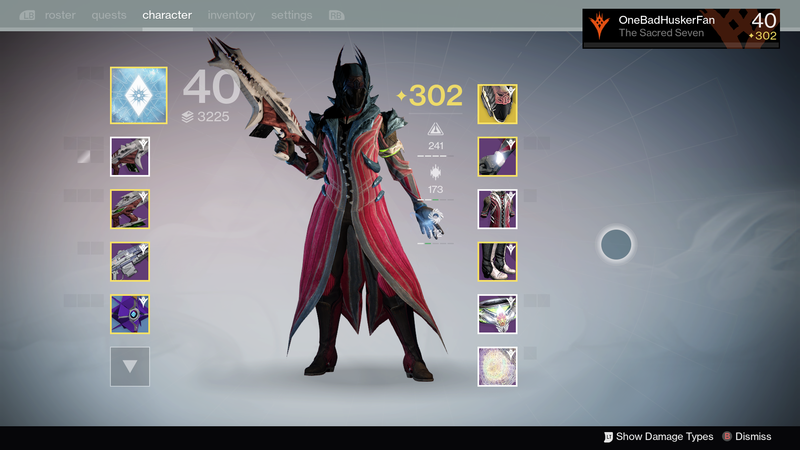 Sitting at 299 1/2 with my loot from the raid last night. Couldn't finish off oryx before the group broke up, but should be over 300 if I can get 5 to help finish it. Ha! Yeah, I'll help you out. It's really not bad if you have a couple other high level guys with you. Also, have some new insight to make Oryx go more smoothly. I got all my mats and kills for the sword come arms day, so I can that with you as well. I also want to know the new strat for oryx. Seeing as I have the oryx checkpoint, I'd like to finish it before the week resets. Just got the pre-armsday stuff wrapped up myself. What element sword are you going for? Well d@mn, we're all gonna have to hook up after armsday and get our swords. I know ReggieB is ready to do his too. He and I got the Arc blades. Got my Titan to 300 last night! The alt was super easy. Just save some of the better drops you get to infuse on your alt. Guns and what not can just be used, but the armor can be infused across classes. Good to know about the infusing across the classes. DeadSockPuppet wrote: Good to know about the infusing across the classes. Yeah, I started saving up some gear for a week or two before I actually started my Alt. I knew I wanted to starting working on my Titan soon so I just saved a bunch of stuff. I hit 280 the first day, right after I hit lvl 40. Hit 295 by the next day and then ran my Titan in the Raid this weekend (we missed you btw). After clearing the Raid I was at 299. Then a few drops later and I hit 300! Still have a Blue chest too lol. I've been doing the same thing. I just created an alt and am about to hit 40. I've got tons of gear up to 300 for infusing. Will be nice to run the raid multiple times and get something out of it. Although at this point I don't gain too much from the raid. Farming for 310 exotics to infuse the gear I like covers most of my gear. It's really just farming for higher level ghosts now. I missed running the raid too, especially since we got to Oryx my last run. I'll probably do the same and get my Warlock to 40 and up next. My Hunter is at 35, but I e already started grinding and I've run the sub mission too, whereas my Warlock still has all of my pre-TTK bounties and all the story to run (better chance of getting 40 sooner). 302, almost 303. I got my 310 sword that pushed me to 301, then when decrypting my engrams I got a 310 exotic chest out of a purple engram! Nice miller! I'm sitting at 303 myself. Once I get a decent chest piece I'll jump to around 305-306! I agree. I'm sitting at between 302-305 depending on what loadout I decide to run with. It's all gravy at this point. I can run with all weapons at 310 along with gauntlets and exotic chest piece and artifact at 310. Currently working on getting back up to 150 legendary marks so I can pick up the Hung Jury (just hit level 3 rep with Dead Orbit) and am thinking about just infusing my 310 pulse rifle into that to get it to somewhere around 305'ish. Basically at this point it's gearing up for the hard mode raid as all content at this point is 300 or less.